How Big is a 6 Yard Dumpster? 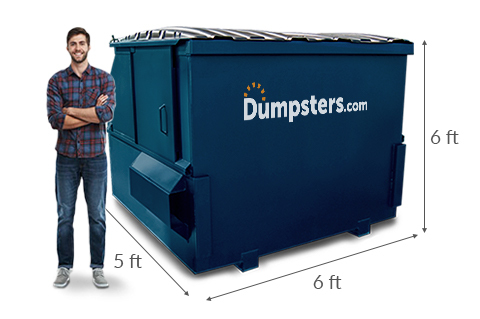 The typical dimensions of a 6 yard dumpster are 5 feet long, 6 feet wide and 6 feet high. These bins hold 6 cubic yards of trash, or about 72 kitchen-size garbage bags. A 6 yard bin usually has a 1,200 pound weight limit. Disposal costs for this amount of debris are covered by our flat rate price. Keep in mind that depending on what you’re throwing out, you may hit your dumpster’s weight limit before it’s full. 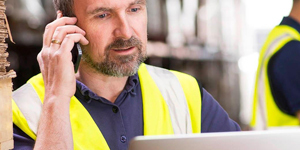 Our team will ask questions about your waste stream to make sure you’ve got the right size for your business. What’s the Price of a 6 Yard Dumpster? The cost of a 6 yard dumpster rental depends on the location of your business, how often you want your bin picked up, local disposal fees, taxes and any add-ons like lock bars or wheels. When you choose Dumpsters.com as your waste management solution, the cost of your 6 yard bin is locked in at a flat-rate price. As long as you follow your rental agreement, you won’t be surprised by what’s on your monthly bill. Is A 6 Yard Container Right for Your Business? Not Sure a 6 Yard Dumpster Is the Right Fit? A 6 yard trash container is a good choice for a variety of businesses, but we also offer other front load dumpster sizes. 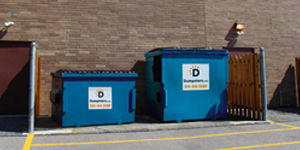 Please keep in mind that you can rent multiple dumpsters in different sizes to meet your organization’s needs. Want help choosing a bin? Give our team a call at [877-880-5286](tel:+8778805286). Our short-term rental agreements are designed to adapt as your business needs change. If you need to swap in a different size dumpster or update your trash collection schedule, just give us a call. With a shorter contract for your 6 yard trash dumpster, you get more flexibility to move or expand than with the usual 3 - 5 year agreements. A lock bar keeps others' trash out so you won’t have to worry about your bin filling up before your scheduled collection. Add these features for a monthly fee. A 6 yard waste bin can handle a range of debris, including general trash, packaging materials and food waste. However, there are a few prohibited items that should not be tossed in your container. To avoid additional fees, please call our team with any questions about what cannot be placed in your 6 yard container. Need to Clean Up After a One-Time Project? Construction materials, remodeling debris and bulky items like furniture shouldn’t be thrown in your commercial trash bin. If you’re renovating your business, switching out the furniture or planning another junk removal project, call us to rent a temporary roll off dumpster to haul away the debris.